Snorkeling Cape Vidal. We are proud to call ourselves specialists at offering you the best guided Snorkeling Adventures at Cape Vidal. We meet you at Cape Vidal and orientate you with a map of the Cape Vidal snorkeling area. With the magical Cape Vidal snorkeling area in view, we start of with a pre snorkeling briefing and a look through a fish identification book to point out species of interist. After that we enter the crystal clear water of Cape Vidal and guide you on a hour and a half Cape Vidal Snorkeling Adventure. 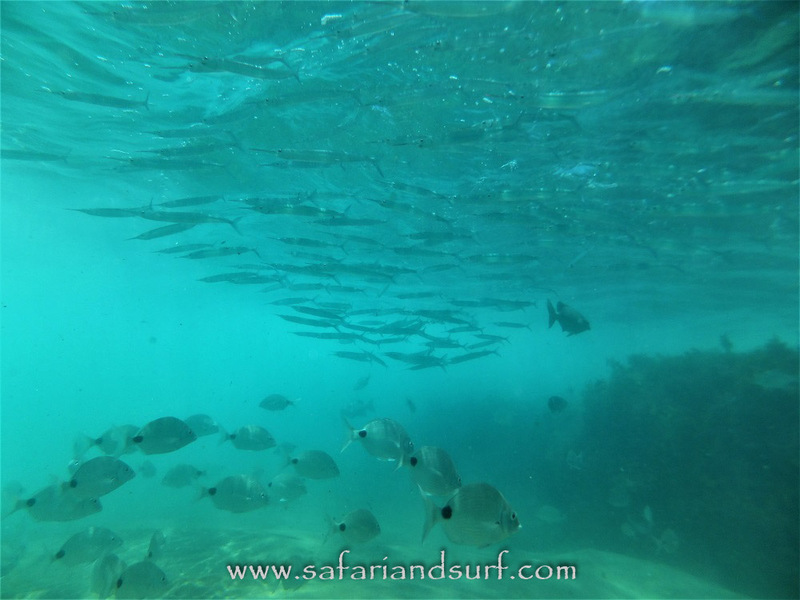 Our Cape Vidal Snorkeling Adventures are run from 6am to 4pm depending on tides and conditions. Snorkeling Cape Vidal. We would like to warn all guests planning on Snorkeling Cape Vidal that there are very strong currents!! These strong currents in Cape Vidal bay have taken many lifes over the years and we strongly suggest snorkeling Cape Vidal with the correct equipment, a local Cape Vidal Snorkeling guide and over the correct tides! 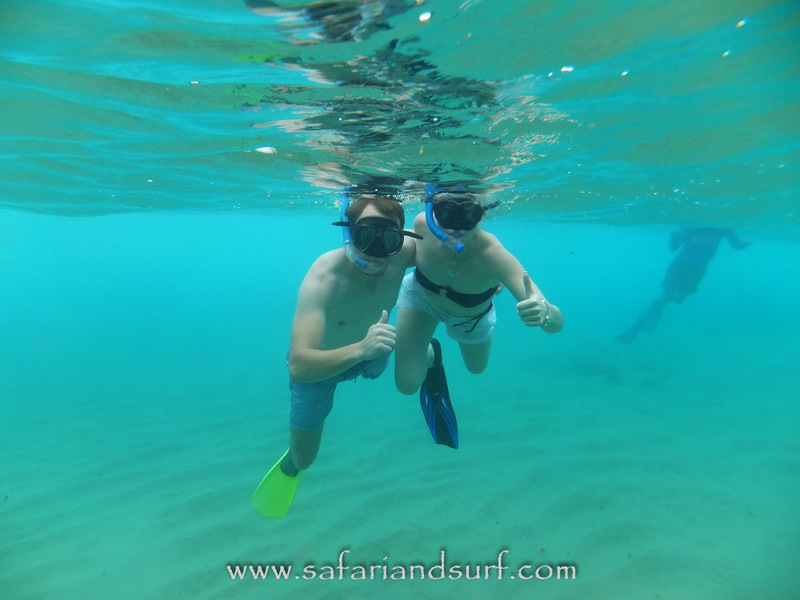 Please note that we cant always gaurantee that we will be able to snorkel on the day as our Cape Vidal Snorkeling Adventure is greatly depending on conditions, swell size and your safety. 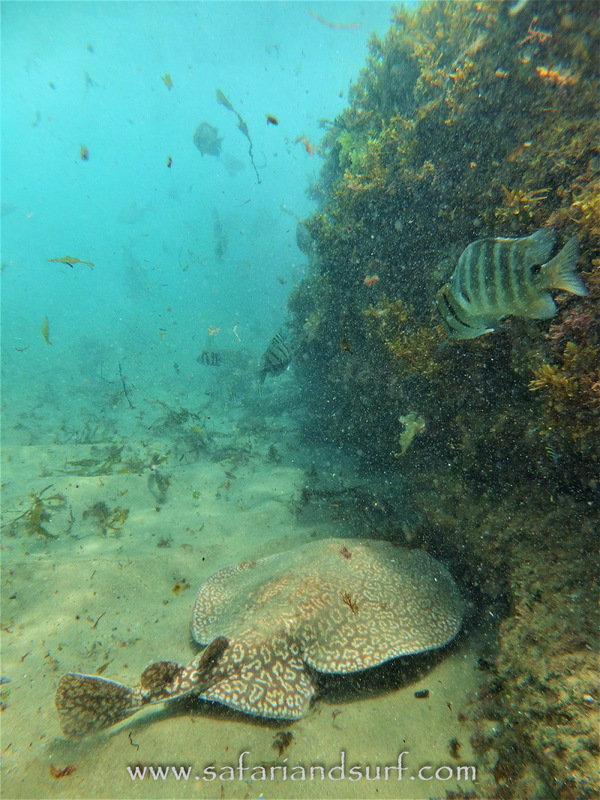 Our Cape Vidal Snorkeling Adventures are one of our most popular activities on offer. For booking we suggest either to email us at info@safariandsurf.com or phone us on +27 72 72 34 215. We suggest that you try your best to make your booking at least a day in advance to confirm the meeting time in Cape Vidal according to the tide. 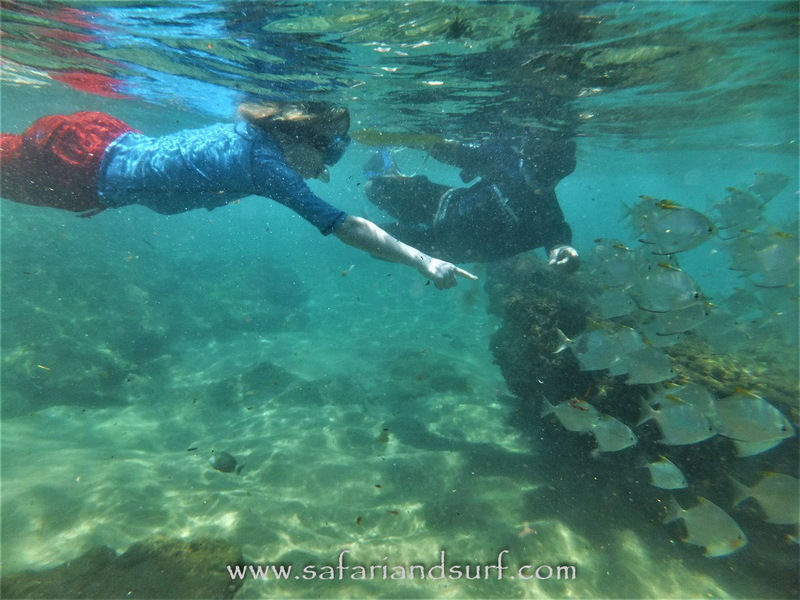 The cost for the Cape Vidal Snorkeling Adventure is R300 per person. There are no bank card facilities at the park entrance so be sure to bring enough cash!!! Our meeting point for the Cape Vidal Snorkeling Adventure is at the little "fuel or petrol station" in Cape Vidal Resort. 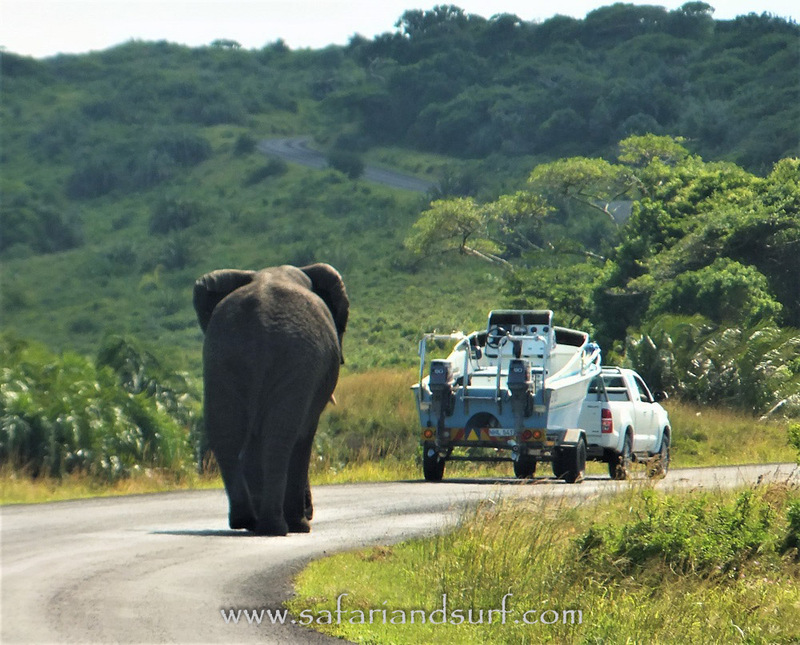 Even though the drive from St Lucia to Cape Vidal is only 32km, the game viewing is incredible and we suggest that you give yourself at least an hour and a half to get there. The road is tarred all the way to Cape Vidal. When driving into Cape Vidal resort, keep going till you get your first view of the Cape Vidal Beach on your left. Another 100 meters further down the road you will see the "Cape Vidal fuel station" on your right. This is where your friendly Cape Vidal Snorkeling Adventure Guides will be waiting for you. For your Cape Vidal Snorkeling Adventure you only need to bring your swimsuit, a towel and sunblock. We supply all the equipment needed. We are proud to offer you the best quality equipment in our field. For your Cape Vidal Snorkeling Adventure you will get a silicone mask and snorkel, set of fins and a rashvest. We however dont supply any wetsuits as the water temperature remain between 21 and 29 'C. We also have a lifesaving rescue bouy in the water at all times to ensure your safety and if anyone feel the need for extra floatation or simply a quick rest. If you are planning on making a day of your time in Cape Vidal, we would suggest taking some lunch and refreshments along from St Lucia as the local shop in Cape Vidal only sell refreshments and snacks. Beware of the monkeys as they are the only criminals in Cape Vidal!!! 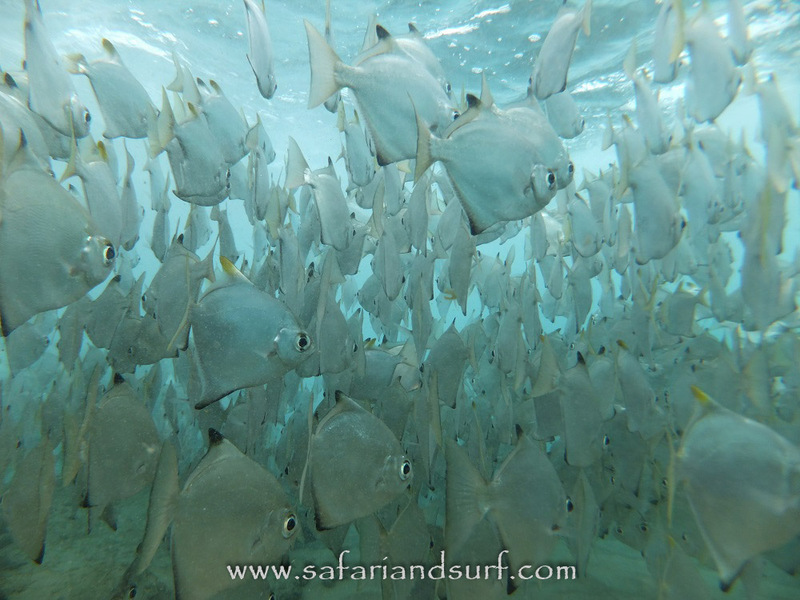 On your Cape Vidal Snorkeling Adventure the list of possible sightings are pretty endless! Our sightings vary depending on conditions and season. Sightings of blacktail, moonies, tropical halfbeak, convict surgeon, damsels, rubberlips, catface rockod, indian goatfish, karanteen, sand steenbras, lemonfish, common lionfish, rectangular triggerfish, moorish idol, butterflyfish and semicircle angelfish are common on most Cape Vidal Snorkeling Adventures. We also get to see green turtles, marbled electric rays and spotted eagle rays on good days. We would like to remind our guests that the species diversity enroute to Cape Vidal is incredible! Please dont speed on the road! Although the speed limit is 50km/h, we would like to urge you to rather drive slower and respect the animals in their home. Possible sightings include leopard, hyena, serval, rhino, buffalo, elephant, hippo, kudu, wildebeest, zebra, waterbuck, reedbuck, red and common duiker, baboons, vervet and samango monkeys. The reserve also boast with 526 different bird species.